VBA macro support was deprecated in ArcGIS 10 and ESRI was planning to stop support after ArcGIS 10.2. Migration of VBA code was only possible to Visual Studio or to Python, but now you can stick to scripting inside ArcGIS with the DotNet Scripting Tool (no Visual Studio license required). Once you have installed the ARIS .Net Scripting Tool and enabled the extension in ArcMap, just select .Net Scripting in the customize menu to start making your custom code. 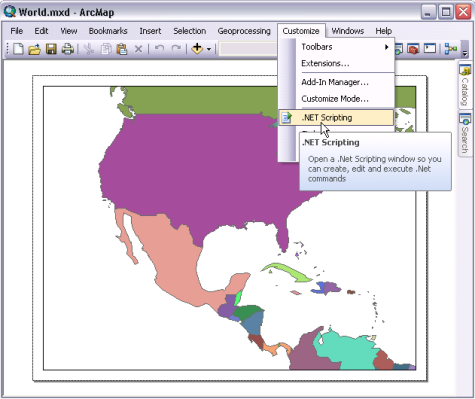 In the example below the VB.Net script adds an extra Map Frame to the Layout View in ArcMap. Replace VBA scripts with VB.Net scripts so you are prepared when VBA is not available anymore in ArcGIS. Test small parts of your .Net applications in ArcMap without making any major changes in your source code. Use .Net scripts to be able to use objects or methods (from ArcObjects) not available in Python. See the User´s Manual for a detailed description. ArcObjects SDK for the Microsoft .Net Framework needs to be installed for necessary references. Visual Studio is not required for the ARIS .Net Scripting Tool. 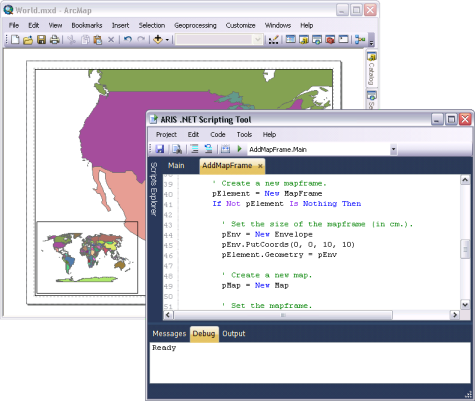 The DotNet Scipting Tool is not available for ArcGIS Pro yet, please contact us if you are interested. Please contact us if you have any other questions about the ARIS .Net Scripting Tool. Interested? You can download a fully functional version, with 5-day trial license by clicking on the "Download setup" link or view the User´s Manual in the table below (available soon, click the Request link below to be kept informed).